Kenneth Rijock's Financial Crime Blog: WITH REIMPOSITION OF IRAN SANCTIONS, WILL US FINALLY HIT LABUAN ? WITH REIMPOSITION OF IRAN SANCTIONS, WILL US FINALLY HIT LABUAN ? If you are familiar with the methods used by the agents of Iran to evade the global sanctions on the sale of its petroleum products, you know that suspected Iranian intelligence agent (and bogus Dominica "diplomat") Alireza Monfared used the Federal Territory of Labuan, Malaysia's tax haven and offshore financial center, to park engorged oil tankers and conduct the illegal sales of that oil. 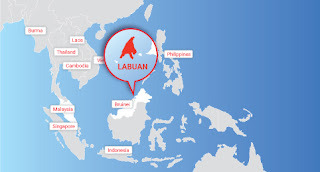 He and his associates used Labuan with impunity, as the US Government failed to take any concrete action against the island tax haven, most likely because Malaysia is a reliable American ally, and American reluctance to employ harsh methods to its financial structure. Labuan is one of the world's most obscure (and remote) tax havens, although Western banks are, yes, in there in strength, taking advantage of its benefits for their wealthy corporate clientele. Bank of America, Citibank, Deutschebank, Standard Chartered, Bank of Nova Scotia, HSBC, and many others have branches, offices or agencies there. Those bank branches had best pay close attention to wire transfers that might be covert payments for sanctioned oil purchases, and which transfers are bound for Labuan. That was, however, under the prior administration. Due to the 2016 Presidential Election, we have a new administration in power, which does not appear to have any reservations about taking action against US allies, where it believes that action is warranted. Financial institutions located in Labuan can conveniently transfer funds to five banks in Malaysia that maintain relationships with Iranian banks. Will the US Treasury, at the urging of the Trump Administration, target Labuan ? We have already seen that Iranian oil tankers, laden down with cargo, have quietly left port, and turned off their automated locator beacons, headed for Asia. Should banks, corporate entities and individuals located in the tax haven draw OFAC designations, it will greatly complicate US and EU compliance tasks regarding large transactions into and out of Malaysia. Candidly, given its willing role in facilitating billions of dollars in prohibited Iranian oil sales, Labuan banks and financial service providers richly deserve to be sanctioned, but such actions will increase risk levels at Western banks whose clients trade with Malaysia, given America's "Take-no-Prisoners" attitude towards sanctions violators located in the USA. it may be appropriate at this time to increase Country Risk on Malaysia, and to red-line Labuan for all transactions. It may also be effective for the US to interdict and detain oil shipments bound for countries that are not exempt from the American sanctions, though that is outside the scope of this article, which focuses on sanctions evasion as financial crime and money laundering.